Need a quick snack before or after trick-or-treating next week? 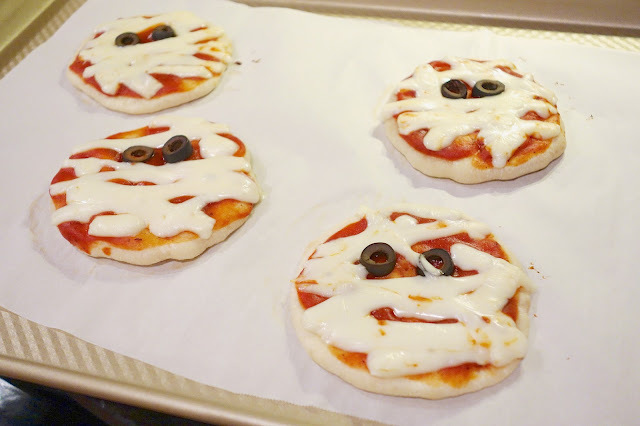 Try these cute Mummy Pizzas. They only take a few minutes to whip up and they are SO much fun to eat. I used frozen bread rolls (Rhodes). I like to use frozen bread dough for a couple of reasons. First, I just like the way it tastes. Second, I can make as many or a few as I want/need. 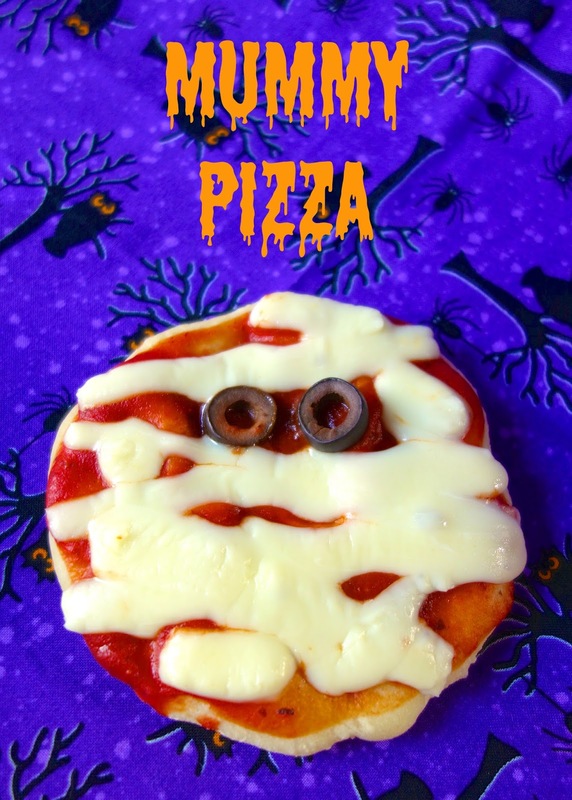 Want to know my secret for making these Mummy Pizzas in minutes? Pop the frozen rolls in the microwave for 40-45 seconds. Don't do it any longer or the dough will start to cook. Once the dough is thawed and you are ready to decorate the pizzas. If you want to make these ahead of time, thaw and bake the dough for 8 minutes. Pop the partial baked dough in the fridge and assemble when you are ready to eat. Roll thawed rolls into a 4-inch circle. Preheat oven to 350 degrees. Bake rolls for 8 minutes. Spread pizza sauce over partially baked rolls. Place black olive slices on top of sauce. Cut string cheese into strips. Place cheese strips on top of sauce. Bake pizzas for an additional 6 minutes.